A 2-in-1 PC, also known as a 2-in-1 tablet, 2-in-1 laptop, 2-in-1 detachable,laplet, or simply 2-in-1, is a portable computer that has features of both tablets and laptops. Before the emergence of 2-in-1s and their denomination as such, technology journalists used the words convertible and hybrid to denominate pre-2-in-1 portable computers: Convertible typically denominated those that featured a mechanism to conceal the physical keyboard by sliding or rotating it behind the chassis, and hybrid those that featured a hot-pluggable, complementary, physical keyboard. Both pre-2-in-1 convertibles and hybrids were crossover devices that combined features of both tablets and laptops. These 2-in-1 devices let users fold the keyboard out of the way or strip it away entirely for true mobility. The essence of tablet computing is shedding nonessential elements to produce the most mobile-friendly systems around. There are two basic designs for tablets that double as laptops, each aimed at a different type of business user. 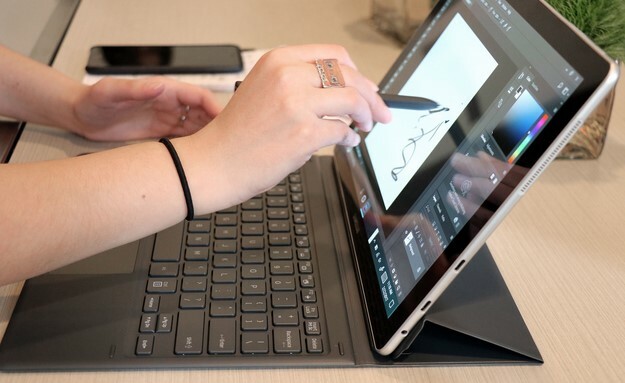 One design, commonly called the 2-in-1 device or detachable, starts with a tablet and adds a snap-on keyboard for typing. Weighing a pound or two, these devices appeal to those who value traveling light above all else, but be aware: The keyboards, which sometimes act as protective covers for the tablets as well, often sacrifice comfort for thinness. By contrast, convertible devices are somewhat thicker and heavier (around 2.5 to 3 lb. ), but their design includes a high-quality keyboard. The device’s 360-degree hinge allows the display to be folded back over the keyboard base so that it can act as a tablet, albeit a thick one. Convertibles can typically assume other configurations as well, including an A-frame tent shape, a lay-flat-on-the-table shape and a traditional clamshell laptop shape that puts the keyboard front and center. Either way, be aware that tablets often have minimal ports. In a few cases there’s only a single USB-C connection, which can force users to decide between charging the system or connecting it to a projector. A dock or hub is a must-have accessory for a hybrid device. Tablets’ touch-screens make them excellent systems for everything from checking email to sketching a new product idea. They may not have the most powerful processors (typically midrange Core i3, i5, i7 or low-power M5 processors) or discrete graphics engines, but they provide enough performance to get through typical work tasks. In general, they’re more tuned to viewing material than creating it. Business-friendly tablet screens range from 9.5 to 13.3 in., with resolution ranging from 1920 x 1080 up to 2736 x 1824 pixels. The overwhelming technology choice is capacitive touch that responds to up to 10 individual inputs from both fingers and rubber-domed styluses. Several tablets, like Microsoft’s Surface Pro and Apple’s iPad Pro, offer (for an additional fee) a pressure-sensitive stylus for more responsive input — a boon for artists. Note, however, that the circuitry in these advanced styluses requires power. The Surface Pen uses a AAAA battery, while the Apple Pencil recharges via a Lightning plug. Many hybrids are highly configurable, with an array of processors to choose from, SSD storage ranging from 64GB to 1TB, RAM ranging from 4GB to 16GB, and prices that rise accordingly. When factoring costs, remember that with convertible devices, the keyboard is included in the price, whereas with 2-in-1 devices, the keyboard typically costs extra. With either type of device, a stylus may or may not be included in the base price. For instance, while the Surface Pro starts at #250k, you need to add #50k for the keyboard cover — and opting to buy the Surface Pen tacks on another #30k. That adds up to #400k, of which a quarter is accessories. Be careful when shopping for tablets; many are geared toward consumers and come with Windows 10 Home. That said, several do come with Windows 10 Pro and include business-friendly features such as TPM and a fingerprint reader or webcam that supports Windows Hello. Finally, don’t expect anything more than a one-year warranty on these systems. In other words, for those who travel, three years of extended coverage is a good investment. Target audience: Those who like to travel light and are more oriented towards viewing content than creating it. Screen size (diagonal): 9.7 to 13.3 in. Buying tip: Try to get a tablet with a pressure-sensitive stylus that can help when sketching maps for clients or drawing a new product design. It can even bring out the inner artist in your employees.